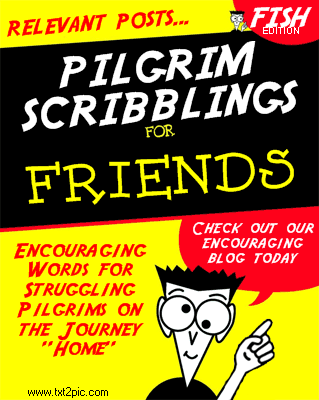 Well, dear dummies, oops, I mean friends, my new book PILGRIM SCRIBBLINGS FOR FRIENDS is finally published and will be launched some day before I die, I hope. Here's a picture of it at least. The cover is ready, the contents are being worked on. Aw!! Are you just kidding us? Julie will be so happy! It was her idea but the rest of us will be in line to buy it too!! I disagree though..You ain't no dummie!! Yes, I too was fooled at first into thinking that you had actually/finally written a book! Come on David...you know you have enough material for a book (or a set of books maybe?). You know you would sell at least one for every reader on here (how many readers do you have?). Terry and I are already "fighting" over who gets to be first in line for the first (signed) copy! Great job David! I'm really impressed by the cover, but you know what they say about books and their covers!!! Hey when are you coming out with "Blogging for Dummies"? You know I need to read it!!! It is just not fair David. I guess now everyone KNOWS how gullible I am! See if I give YOU anymore encouragement boy!! And it even brought Brodie out of the wood work! !...That guy is even admitting HE is a dummie and that Julie is trying to fool people on HER site too..
What you might find my dear friend is a real live mutiny on your hands and it will SERVE you right!! I am not going to sign this letter so you won't know where it is coming from..Yeh..sure! !Some dummie I am!!! That "Blessings" say it all..
As you know. I ALWAYS come to your blog first David and NOW I have to visit all the rest of my blog friends and pretend how smart I am and how nice!! Hee Hee! !